When the hot summer nights end and the crisp fall evenings take their place, we open our windows once again. And a highlight of these transition weeks between hot and cold is the nightly sounds of the katydids in the forest surrounding our home. 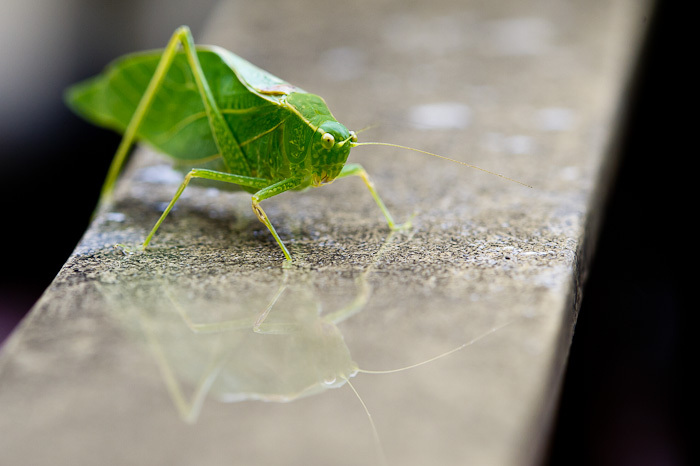 Known as one of the loudest insects in North America, katydids sing throughout the night. With males and females both calling, their cacophony of sounds send us to sleep feeling as if we’re surrounded by nature. Sometimes the katydids end up lost on our deck in the mornings, and I remove them from the screen door and place them back in the trees. This afternoon I found this lonely insect hanging out on the arm of a deck chair. It appeared to be gazing at itself in the reflection. Because it seemed so content, I left it sitting there while I retrieved my camera. Maybe tonight I’ll hear this one singing to itself as it reflects on the end of yet another fall evening. I know what you mean… between the Katydids, tree frogs and toads we have a regular symphony in the woods here at night. It can get pretty loud at times! !